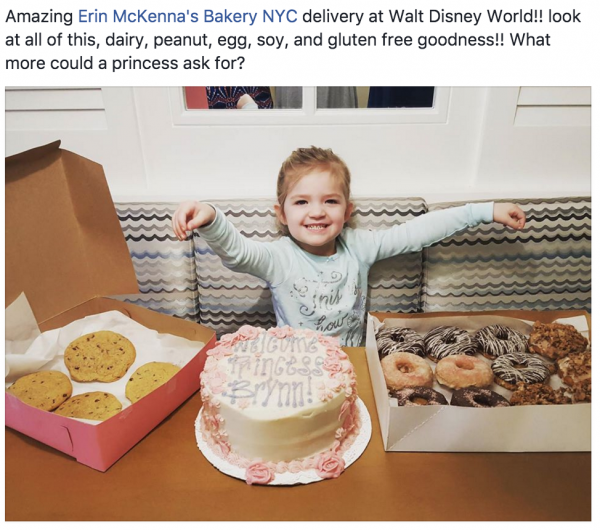 In the latest episode of Food Allergy FastPass, we speak with Nessa from Erin McKenna’s Bakery in Orlando. 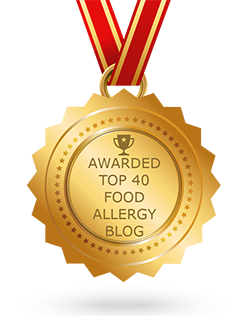 Food allergy policies and the move to “allergen friendly” in addition to vegan and gluten-free. 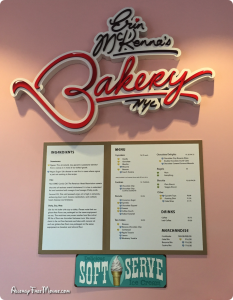 Why Babycakes NYC became Erin McKenna’s Bakery. New products, like milkshakes, and special items for the Holiday Season. New services, like Disney-owned restaurants and wedding cake delivery! Locations in the Disney Parks, including a new location in the Magic Kingdom, in addition to the Animal Kingdom location. Locations in the Disney Resorts. Future possible plans, like Disneyland and Disney Cruise Lines. And many more tidbits. Check out the Food Allergy FastPass podcast! Back in 2012, Kathy Kelly interviewed us and she reposted it on her Special Mouse site here. She just posted our latest discussion in her podcast. We discuss a lot of things, including some you might not think about when traveling to Disney World. We also discussed the new Allergy Menus that have been appearing at restaurants all over Disney World. Follow this link to the Special Mouse podcast. Literally. He wrote the book. And it is based on the process he helped create in one of the biggest, most massive food service operations in the world – Disney World. 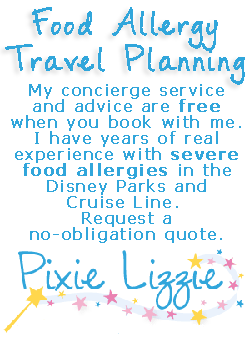 Plus the Disney Cruise Line. It is not a book about the Disney process, but rather a book to help chefs and restaurant owners develop their own processes. I first communicated with Joel Schaefer via Twitter (@AllergyChefsInc) and then emailed him requesting some information about Disney, since this is a website for Disney fans with food allergies. He suggested we speak and called me. I already knew about his past “employment” at Disney as part of the Special Diets Program and his involvement with AllergyFree Foods as the Research and Development Chef. But while awaiting his call, I spent some more time on his website, AllergyChefs.com where I discovered his forthcoming book Serving People with Food Allergies: Kitchen Management and Menu Creation. There I learned the real story as I read the Foreword and Introduction for the book on Amazon.com. He was the Culinary Development and Special Dietary Needs Manager for Disney and developed the fabulous Special Diets Request Program. And, after our conversation, I’m convinced he truly has a heart of gold and is on a mission to bring food allergy preparation into the mainstream and open up new dining experiences to those who have limited dining choices, like our daughter. However, our phone conversation was not about his book, it was about Disney and their food allergy process. But after reading the Amazon preview and talking with him briefly about it and his work, I feel really strongly that this book needs to be shared. If you know someone who owns a restaurant and may be interested in making life better for food allergic patrons, while also opening up new revenue opportunities, they need to read this book. But they have to go “all in” since food allergy preparation is potentially life threatening for some customers. A restaurateur cannot dabble at creating a food allergy program. And it says this in the book — it’s a full commitment or don’t even start. However, it’s not insurmountable either. It scales for restaurants of all sizes. The book is also full of really interesting food allergy facts, statistics and medical information as it is meant to educate chefs and restaurant owners about the scope of food allergies, as well as open their eyes to the potential market — food allergic people begging for assistance and increased choices. It also contains some terrific food allergen-free recipes. Check it out. We met with one of the managers of a Disney restaurant yesterday. She had actually already visited the website and was a fan, when she spotted my shirt and came over to tell us about upcoming changes to the reservation system. Currently, if you reserve a dining reservation online, there is a selection of the top 8 food allergens along with “other” as an option. The new system will allow you to specify in greater detail about your food allergy. It will also generate an additional email to you, or even a phone call, depending on the food allergy, so that Disney may discuss how to accommodate your needs. This is great for people who have allergies to foods like corn, sesame and other ingredients common in restaurants. It’s just another way that Disney is changing to better serve everyone. In fact, it’s part of Disney’s constant refinement that is a part of everything they do. The manager also alluded to a need to refine the food handling process as the demand for food allergy-free meals is increasing. Of course, everyone should still contact the Special Diets team and complete a request form. This is an older video, from mommywood.com, interviewing two chefs at Disney Land. It’s great to hear how well this policy was implemented, even three years ago.